SUPER BOWL XLV – THE OUROBOROS | Watchman - Declare What You See! It has already been mentioned in previous articles that I fully expect that the next world leader, the 45th, to be the Antichrist/Lucifer – Satan incarnated in human flesh. U. S. Presidents have filled the position of “world leader” for many years, and the current man in the oval office is the 44th in the line of U. S. Presidents. Having the U. S. Dollar as the world’s reserve currency, in addition to the Federal Reserve System acting as the world’s current financial system along with strength of the U. S. military, has positioned America at the head of world leadership. All this is about to change! 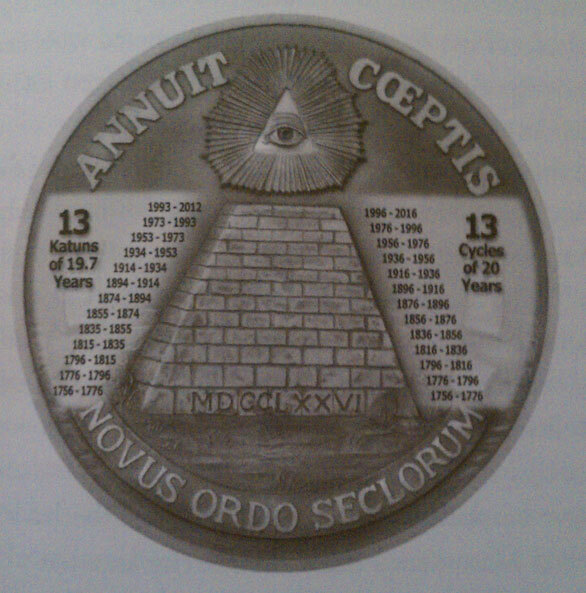 From the founding of the Illuminati and America (The New Atlantis) in 1776, this nation and its leaders have been on a path to “Destruction” (Phoenix/Eagle Symbology on The Great Seal) that seems to have reached new heights since the 9/11 event took place in New York City. It appears that almost everyone is waiting for the next big “happening” to occur that will further erode the freedom of all Americans and push us even closer to the arrival of the Son of Perdition! Forty-five is a “special Occult number”, and as we have already seen, it is 4 + 5 = 9, which is the number of “Perfection” in the Occult/Luciferian religions. Also, 4 x 5 is 20 which is the number of years between U. S. Presidents elected in the “Zero Year Mystery” and the number of years in the Mayan Numerical System associated with 19.7 and 20 years. In speaking about Tom Horn’s book, Apollyon Rising 2012, the following article presents a concise overview of this system. “The antediluvian (or pre-diluvian) period – meaning “before the deluge” – is the period referred to in the Bible between the Creation of the Earth and the Deluge (flood). The story takes up chapters 1-6 (excluding the flood narrative) of Genesis. In popular culture, the term is used to refer to any ancient and murky period. According to the above information and other sources, NFL is literally connected to the “fallen angels” (fallen ones) in the Hebrew language! Here’s a few links that discuss the “fallen ones” if you have an interest in reading more about the subject. We have already looked at the associations of the number 111 in previous articles, including the fact that it is the street address of Ronald Reagan’s birthplace. However, there is one new observation that I would like to make. The number 111 is part of the number 1110, the zero completes the cycle, which you will understand more clearly as we proceed. The numbers, 1110 + 666, is 1776 – the date that started the countdown to Satan’s New World Order under Antichrist/Lucifer! Will the 45th NFL Super Bowl complete the “mysterious cycle of incarnations” spoken of by 33rd Degree Masonic guru Albert Pike? Is the Phoenix and the Ouroboros about to further play-out America’s Destiny in Super Bowl XLV by finally coming “FULL-CIRCLE”? See Part I of The Lucifer Project – Raising Antichrist for further review of 1776. As mentioned in previous articles, the number 1212 is the same as the number 33 and the same in inverse order. (1212: 1 + 2 =3; 1 + 2 = 3 or 33; 33: 1 added to 2 = 12; 1 added to 2 = 12 or 1212) If the number 33 is the most revered of numbers by Luciferians, then 1212 could also be thought of as representing the number 33, and also being a revered number as well! The “mystery” of the 33rd Parallel runs deep, so I’ll post some observations and links for those who desire to do further research while limiting my own comments in this article mainly to the upcoming 2011 Super Bowl event. The 33rd Parallel is the location of Super Bowl 2011 in Texas! The Illuminati/Luciferians do not welcome “competition” when it comes to “power and/or control”! Texas has previously issued threats to secede from the Union, so it’s already in the “cross-hairs” of the Illuminati to eliminate that possibility from happening! Texas also ranks first in death by execution of convicted criminals, and the Luciferians draw power from any type of “blood sacrifice” – even of their own followers! Is a massive “blood sacrifice” being setup for the 2011 Super Bowl to push the Illuminati “Great Work” into fruition? As we continue unraveling the “mysteries” of this soon coming event, I believe that you will be amazed at the implications – both in the physical and the supernatural realm! As one of the largest population areas in Texas, the Dallas-Fort Worth-Arlington area is one of the largest; and millions of people will be watching Super Bowl XLV via TV worldwide. Any form of physical destruction would be devastating to the population of the area and to America, as well as sending a “message” to millions watching worldwide that the “terror threat” is real. Imagine what would be implemented afterward to further take away the freedom of Americans in comparison to the 9/11 event in which only 4,000+ lives were lost! The Illuminati goal of Order Out of Chaos would certainly be accomplished if this were to occur! This one event alone could be sufficient to bring in the Mark of the Beast! Most everyone knows by now that the nickname of Texas is “The Lone Star State”, but we’ll see how this fits into the things being revealed herein. As you can visualize for yourself, the Pentagram certainly appears on the flag of Texas which flies at the same height as the American flag in Texas. Super Bowl XLV has planned a Halftime Show with a band entitled, The Black Eyed Peas. Let’s take a quick look at how this event and the band appears to complete a planned “Supernatural Time” at Super Bowl XLV. The Black Eyed Peas completed, in 2010, a world tour that started in 2009. What could be represented in the name given to the former world tour? At first sight, the E. N. D. of the world (Old World Order) is stareing us all directly in the face. Only a hermit could possibly be unaware of world conditions, and only then if he’s not having to purchase goods and services like gasoline, food, water, clothing, shelter, and electricity in order to survive! I left out vehicles, since millions of people have no place to go, no money to spend when they get there, and no job that they need transportation to and from. With Banks paying close to ZERO on IRA’s, 401K’s and other forms of retirement plans as well as personal savings accounts and CD’s, even a hermit would soon have to “face the facts”, grab a gun, a rock, or a stick, and go rabbit or squirrel hunting to avoid starvation in the “Land Of The Free And The Home Of The Brave”! The E. N. D. is an abbreviation for “The Energy Never Dies”. This is a religious belief for millions, if not billions on the planet, who accept and believe in reincarnation! That is, we all just come back in another form (energy)! How does this play out in the overall scheme of the totality of this blog? Think about the “god returning”, as in the Apotheosis we covered recently, to rule and reign once again. However, “death” must occur first before anyone can be “raised again” into a “new state of being”. Is there any science that would back the slogan of the Black Eyed Peas E. N. D. World Tour? Yes there is! “The first law of thermodynamics is an expression of the principle of conservation of energy. It is the belief of Illuminati/Luciferians that they are “doing god a service” by eliminating “useless eaters” in order that they can return in a better “state of being” than that in which they left life. Also, they believe that the “elimination” of millions will solve the “overpopulation” problem in relation to the limited food and water resources now facing the planet! The “changed ones” are expected to return in another “form” – be it man, woman, child, animal, or a plant, etc. which would better “harmonize” with the planet and its remaining inhabitants! The New Age Movement is still “alive and well” in its promotion of death to the masses! The “End of Life” provision recently reinstated by Presidential Executive Order, after having been removed from ObamaCare, is only one indication of this fact! This has often been referred to as the “Death Panel” in the news – panels who decide who receives “end – of – life” medical treatment and who does not. If you’ve read this entire series of articles, then you might recall that Ronald Reagan’s campaign slogan in 1980 was for a “New Beginning“. Will Super Bowl XLV usher in a New Beginning for America and the world? The album cover of The Beginning. Also William of The Black Eyed Peas refers to himself as Will. i. am, which reminds me of the following verse. The End and the Beginning is a picture of the Ouroboros swallowing its tail – Satan’s imitation of the real Alpha and Omega! Next, let’s examine The Time (Dirty Bit), a song from The Black Eyed Peas sixth studio album entitled The Beginning. The following is a cover used to promote the song and the new album. Is this The Time in which some kind of Dirty Bit will be released, not only on those in attendance of Super Bowl XLV, but upon the entire world? Will an actual “physical event” of catastrophic proportions take place in Arlington, TX during Super Bowl XLV, or will it be a “happening” that is only significant in the “supernatural realm”? It could well be both! The logo of The Time was re-pixelated to produce the following image of the “time piece” exploding. This could well represent a real explosion of a nuclear or biological weapon, or some other kind of physical destruction during The Time of Super Bowl XLV! There’s no question that it would appear to the world’s population as a Dirty Bit! The story of the Phoenix is nothing new, but it’s a story of the Illuminati/Luciferian belief system out of which the New World Order is expected to come from the ashes of the Old World Order – a “rebirth” or “a new beginning”! Please note, in the Wikipedia article that the Phoenix deposits its egg in the city of Helioplis (sun-city) in which the egg is supposed to then bring forth the old life in a reborn state! Helioplis was the center of Sun-god worship in ancient Egypt. What was being birthed at Sun – City? What does the Yod have to do with Super Bowl XLV? Take a look at the following for comparison and representation of the “hidden meaning” of symbols. Not only does “hands” on the time piece resemble the Yod, but it also resembles the number associated with “spiritual perfection” – 7! “The Ouroboros or Uroborus is an ancient symbol depicting a serpent or dragon eating its own tail. The following image, with the Ouroboros appearing as a “crown” above the head of the woman, seems to “sum-up” the total picture being portrayed in Super Bowl XLV as well as the Halftime show. The woman holds a “time piece” (hourglass) in her left hand indicating that “time” is running out, and her elbow rests upon a human skull implying that death, and the time of it, is under her control! Of course, the flowers and her being almost naked implies that SEDUCTION is a major weapon and goal in the overall scheme of this demonic display called “art”. The death of the old and the rebirth of the new is loudly proclaimed by the Ouroboros alone, but the other symbolism in this scene speaks volumes for those with “eyes to see”! Let me attempt to summarize just a few things in light of what has already been shared in this article and on this blog in relation to the upcoming Super Bowl XLV in Arlington, TX. We have seen that Cowboys Stadium is situated on the 33rd Parallel, has the number 9 in the street address, is the 45th Super Bowl (4 + 5 = 9); and the Halftime show appears to have much associated with the Supernatural being played out. What else is available for consideration in the overall picture being portrayed by the event? Cowboys Stadium is very close to the Ronald Reagan Memorial Highway, and it is located almost precisely at 33rd degree longitude and 100 degree latitude. Note, the point of the marker rests upon the 33rd degree latitude line, not above it as might appear in the map image below. 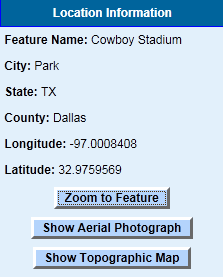 While the latitude and longitude of Cowboys Stadium at the 900 E. Randol Mill Rd., Arlington, TX address is very similar. See both addresses listed for Cowboys Stadium. If you’ve been wide awake while reading this article, then you realize that Super Bowl XLV will take place on February 6th, 2011, which is the exact same day that the 100th Birthday Celebration of Ronald Reagan begins! My prayer is that no life will be lost due to anything that might occur at Super Bowl XLV, but the WARNING MUST BE SOUNDED! Both sites, Super Bowl XLV and The Ronald Reagan Library, have countdown meters on their respective sites depicting the time remaining until each event begins on 02/06/2011. Reagan’s favorite number 33, and his 100 year birthday celebration is depicted on the 33rd Parallel, at 33rd degree latitude and at 100 degree longitude! Are we about to enter into Rod Serling’s Twilight Zone? Thank you, again, Watchman. I stand with you in that prayer. Strange…..just today I had an eerie feeling about the super bowl this Sunday. Is it a coincedence that Obama plans to attend as well as the military will be there as security? I think not…….May God have mercy on us all. wow, there is alot of connections in just this ONE area and date. This world has gone crazy this last month. with birds, fish and varies animals dying. And now just this last week… Eygpt, all of the Middle East, volcanos, earthquakes, cyclones, flooding, blizzards and magnetic pole shift change. Should we go on? This world is FALLING APART!! The verses in the Bible are being fulfilled before our very eyes. If people don’t see how this world is changing sooo rapidly….they need to WAKE UP and realize there is a God in Heaven! And, He’s just waiting to be excepted as their Heavenly Father. My heart goes out to anyone in harms way that doesn’t know Jesus as their personal Saviour. Watchman…you did a great job connecting ALL THE DOTS to this one event. Was that a lot of work? Or did it just fall in your lap so to speak. However, it is just mind boggling of all the many areas that point to one day in time and place. SCAREY!! By the way…have you warned your daughter and family? I had this tagged on my favs to read. I just read today, Feb 5th. Maybe you should do a rerun on this for today or tomorrow?? For some like me that has had a death in the family…my reading is behind time. PS. What is your take on the GREAT DECEPTION? Do you agree with some saying it will be the announcement and revealing that there ARE aliens among us? And, THEY REALLY ARE the fallen angels of the olden days? Could this be why the Bible says men will faint? Even the very elect will be decieved? Did you see the recent video of the space ship above the dome of rock? Wow, that was fascinating to say the least. Keep up the good writing! May the power of the Holy Spirit reveal to you the truth of this SINFUL WORLD!! Oh, how I can’t wait to be in our Heavenly Home. Can you just imagine what it would be like to live in a SINLESS enviroment? Just has – to be totally AWESOME!! Really appreciate your kind comments on my work! Like all my articles, it seems that they start with something that I feel the Holy Spirit is “pointing out” as very relevent to the “times in which we live”. Then, when I sit down to write, the “flood gates” are opened, and the information just seems to flow! More often than not, the article goes in a totally different direction than where I thought it would when I begin to write. Almost all the articles are written in one session, as the “inspriration” comes all at once instead of over a period of days. When I began this series of articles, the only clear “impression” I received from the Holy Spirit was to post The Lucifer Project – Raising Antichrst. After that was finished, I told my wife that I felt that I had accomplished what the Lord had “commissioned” me to do, and that I no further desire to post anything more. I did not set out to be a “blogger” or to write articles about anything; and I only publish an article when I feel the “commission” to write about something that needs to be addressed or exposed to those who “have eyes to see and ears to hear”! It is my belief that the GREAT DECEPTION will include a fake alien invasion (demonic enities) posing as our “creators”. This would serve to discredit all the world “religions” in one fell swoop in order to establish the New World Order, under Antichrist/Lucifer and the False Prophet while offering “eternal life” via “cloning” to the human race. I also believe that these enities will claim that the human race was simply a DNA experiment; and that they will further claim to have authored all the “holy books” of the world’s religions including the Bible! I also believe that the teaching of a pre-trib rapture will be part of the GREAT DECEPTION, and will lead millions, if not billions, to accept the “Mark of the Beast”. It is my personal belief than many, if not most, pastors and teachers who teach this doctrine will not admit error even when faced with the coming Antichrist and his “Mark”! When you consider that the majority of “pastors” fit the category of “hirlings” in our day, this becomes even most plausible! Consider this as an example: If the sick, old, deaf, blind and dismembered members of the human race (everyone will eventually fit into one or all of these categories) could receive the promise of “eternal life” via “cloning” from a “Alien Superhuman Race” who could provide “scientific proof” that they were the original “gods” of all religions, then the world’s population would fall at their feet in worship! What better “scientific proof” could be presented to the world than to have two of the world’s most popular world leaders, political and religious, reappear in the form of a clone? It is no secret that the world’s major governments are involved in “cloning technology”. An alien SuperHuman race could offer PERFECTION of the process for all humanity! Yes, I did see the video of the UFO’s over the Temple Mount and Dome of the Rock. I believe that this is just a part of the beginning of FULL DISCLOSURE soon to come by the major powers in world government which will serve the above agenda presented perfertly. Having personally witnessed UFO’s up close and in broad daylight on three different occasions, I can certainly attest to their reality! Also, a strong sense of DEMONIC influence was present at each one of these sightings which bears witness as to their source. most all of what you say about the coming deception being the “staged aliens” from the fallen angels…is what LA Marzulli and Tom Horn are saying. I just saw a video with them a couple days ago. But, have been reading more and more about this topic on the Christian blogs for a few months or so. Also, on the Chinese news last month – they told their viewers that by the end of the month (January) “O” would make an annoucement to the americans claiming “Aliens” to be real and among us. As we both know that didn’t happen. but still….that’s a little scarey that we are right on the verge of this coming out in the open. But, to look on the bright side….”Our redemption draweth nigh! !” PRAISE THER LORD!! LA and Tom were saying that the script that says “Just as it was in the days of Noah, so also will it be in the days of the Son of Man. Luke 17:25-27 Meaning when the genectics of blood during Noah’s time was so vastly contamented by the “fallen angels or demons” with the beautiful women of that time; will be the same as you same in our time of mixed dna with “aliens” which we know as demons. It all clicks and makes sense. I thought before this view of the “aliens/demons”, it was because of the homosexuallity and immorality being so open. But not anymore. It is amazing how over time, God opens our eyes and ears to see and hear and understand the signs of the time. Way a while back when I heard that a phsycologist was studying patients that had been “abducted”; he interviewed a woman that had been visited more than one time by these “aliens/demons”. She wasn’t saved during these visits. The next time they came into her bedroom at night, she “rebuked them in the name of Jesus” and they fleed from her and never returned. This was the beginning of many – plus me thinking they ARE really demonic. Wow, this world is just not what we think it is to be. Not just this one topic, but in countless. The spiritual world and just everydaY BAD humans are soo corrupt and has done and are doing terrible things under the table. We as Christains are so naive and trusting. Todays days of reality is like the truth hitting the fan and flying right into our face! There is a video on You tube by a man that has given up everything, including a wife that doesn’t believe him; claiming God has given him a vision telling and showing him there is proof of these aliens/demons going back to the days of the Pyrimaids. He describes the ancient art of Eygpt that shows the aliens/demons mixing with humans. So, I believe you are right on track with them saying they go way back and are our creators, etc. This surely will turn the heads of the so called Christians of this day. And I also believe as you, many will fall just as the Bible says…there will be a great falling away and men will faint. Oh how this makes my heart soo heavy. I feel like I want to tell the world the truth before the revealing comes out…but I would be put in a padded room! I guess I have bored you to tears, because you know all this already. It is just amazing to me. And, I can’t share with others because they already, including my husband, think I’m crazy. but, I’m not! I truly believe the Holy Spirit is opening my eyes and giving me wisdom to know what is coming in the very near future. Oh please keep writing! It is wonderful to read from someone that follows the leading of the Holy Spirit. It is totally amazing how words whether typed or spoken can just flow out when the HS works thru us! I will put you on my fav bar instead of my favs now!! May God bless you and annoint you thru the POWER OF THE HOLY SPIRIT to give us the topics and words He would have us to read! Have you guys noticed the new volkswagon commercial? Chilling………to say the least. This event is littered with 9/11 subliminal numbers and even stranger is the fact this is happening on 2/6/11. During the WTC ritual, a key point in the set up was that the towers reflect in the waters below, signifying what I assume is the underworld. Coming to the end of a cycle here; is this the end of a large 9 / 11 ritual? The 33rd parallel is where the Arizona shooting happened and 9/11 was of course extremely involved with this obvious ritual sacrifice. However, according to two different sources so far, Google Earth and another simple website, Arlington Texas is located at 32 degrees. However the poles are most definitely shifting and things like GEarth are still very inaccurate as to where the actual poles are located. Last time I checked my compass it was way different from what I remember as a little kid and that was just a short amount of linear time ago. 9 and 11. No doubt this location was chosen on purpose, and it happens on none other than a Sun Day. Can you please take a look at this post I made regarding these syncs I’ve just received today about the Superbowl; you might find it interesting. I will pray with all that I have for the people of Texas today…..:( I PRAY that NOTHING happens!!!! in regards to 111 (000) Cowboys Stadium Capacity,111= the days left in the year after sept 11. I’m not really quite sure what you are saying with the correlation between 666 & the antichrist. On that note, you can also add the age you are going to be THIS year and the year you were born and for EVERYONE WORLD WIDE the result is 111…..unless you are born after 2000….then it is 11. IMO, it is because Jesus will take the children……under 12. 111 may be our battle with the antichrist………..???????? Can you be more specific, as I’m not sure what you’re asking about “the correlation between 666 & the antichrist.” As for the number 111 and everyone’s birthday caculating to that number, we already addressed that in one of the previous comments made by “Engineer”. Oops…I meant Christ…not the ‘anti’. I’m still in the “dark” about your question “He Lives”. Can you point me to the section of the article that you’re asking about regarding 666 and Christ? It was in response to Dan Odem who commented on this thread. O. K., “HeLives”, now I understand what’s you’re addressing. It was Dan Odem’s comment, not a part of the article which I wrote. While Dan will have to speak for himself on his comment, my “take” on what Dan stated was that he found that by using a base of 9, that Jesus and Messiah both have a numerical value of 666. While I haven’t checked Dan’s math using a base of 9 as a gematria code, my question would still be, which Jesus and which Messiah is being revealed when one uses Occult Numerolgy? In my opinion, it IS NOT the Jesus we know as the real Messiah of Scripture, but a “false one”! It is interesting that using a base nine gematria system, per Dan, that this is what seems to be implied, since the number nine in the Occult is the number associated with the coming Antichrist/Lucifer – MR. PERFECTION! As pointed out previously, the word “perfection” = 666 in the Sumerian Code base of six. If you haven’t had a chance to read The Lucifer Project – Raising Antichrist, you might want to do so, as a lot of questions you might have may have already been addressed in those articles.